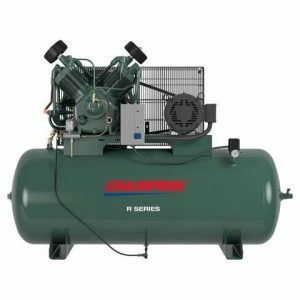 If you are a woodshop owner or mechanic, chances are you are going to need a commercial air compressor. There are few large air compressors for sale on the market. Those industrial Air compressors have a unique set of specs. The business owner must know what his/her requirements are and carefully examine the specs. In order to decide on the best commercial air compressor, we will review each compressor based on the following criteria: power, price, and quietness. Important Disclaimer: We included the Best Commercial Air Compressors we could find online. However, if you are looking for the best commercial air compressor for your business. We recommend filling out the form. will contact you with a FREE quote. Air Compressors are mechanical devices used to increase pressure in different compressible fluids or in the air among other gases. Large Air Compressor is usually used to supply a certain tool or an entire shop with air. The air is used to power air tools, abrasive blast equipment, paint sprayers. In addition, a large air compressor is used by industrial refrigerants for air conditioning and refrigeration. The Air conditioning system depends on a steady stream of air to propel gas through the pipelines. Compressors are divided into centrifugal (or dynamic or kinetic) and positive-displacement types, more often being the latter. They can range in size from a few gallons to the gigantic machines found in pipeline service. This review will focus on the best 100, 120, and 200-gallon air compressors. Air compressors are vital in many manufacturing processes. Furthermore, it is used in a wide range of industries, such as home and office construction, automotive, sports and recreation, commercial art, construction, purification services, and marine safety. 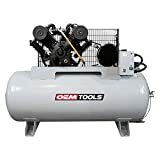 We’ll be reviewing these large air compressors based on the following criteria; engine speed and power, pump pressure (PSI), tank capacity and ultimately their price. The compressor has enough power to operate more than 1 tool at a time with its 35.0 CFM at 100 PSI; 33.6 CFM at 175 PSI; 3/4″ air outlet. It features a unique Metal Belt Guard Design that improves pump cooling by as much as 60% over other designs. On the downside, the product comes with a limited factory warranty of just two years. Purchase and use of maintenance kit double the pump warranty. It has the motor voltage of 230 Volt AC, a magnetic starter, 10 HP engine and pump CFM 35. The pump is made of solid cast iron, two-stage pump type. There is an oil sight glass, but no aftercooler. 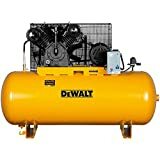 The Dewaltcast iron two-stage air compressor is a uniquely designed compressor with a large capacity to handle large loads and heavier pneumatic tools. The two-stage function ensures more air can be compressed. This compressor comes with a mounted magnetic and pre-wired starter, making it easier and quicker to start up. The compressor provides 33.6 CFM at 175 PSI, making it perfect for applications that involve a longer run time for all kinds of air tools. The unit is very durable, being constructed from cast iron. The patented pump design ensures a cooler running pump, which adds to the durability of the system. The compressor operates on a heavy-duty, three-phase induction motor that features a running horsepower of about 10. A uniquely designed belt guard that ensures better cooling of the compressor pump is included. Furthermore, the cast iron flywheel and patented pump design make for more efficient cooling. This means the machine will never overheat, maintaining a consistent compressing efficiency throughout its life cycle. The two-stage function is not only powerful, but also helps operate more than one device at a time. OEM is unbeatable when it comes to reliability and delivering high-end products. Its 120-gallon industrial air compressor is yet another example of the company’s consistency. Its large horizontal compressor can be used for DIY purposes when you need extra power for your tools. The maximum operating pressure of this unit is about 125 PSI. However, it has no problem delivering 35 CFM at 100 PSI. This means you can use it to provide air to grinders, power ratchets, drills, or whatever other tools you need. The heavy-duty cast iron pump is perfect for durability and performance. It operates at a low RPM, which further adds to the durability factor. You don’t need to buy a separate starter for the motor on this unit because the starter is included, as are the oil and air filters. What is more, the compressor does not require a lot of maintenance or servicing. In fact, it ensures longevity and effectively reduces maintenance. Optimal cooling efficiency is ensured by the heavy belt flow guard. The unit also includes tank and safety valves that adhere to the ASME standards. Optional belt guard after coolers are available (sold separately). You need to order them when making the compressor purchase. The 200 Gallon ASME Tank & Safety Valve makes it a safe addition to any facility. The top-grade air inlet filters ensure clean air for extended operational life. Leading industry factory warranty from bumper to bumper protects your investment for two years. The patented Centro-Ring pressure lubrication system delivers 100% continuous duty over an extended service life because all the most important components are properly lubricated. Finally, the compressor arrives factory oil-filled, which means you’re ready to use it at once. The heavy-duty, sturdy, stamped-steel belt guard protects both the drive belt and the operator, and the manual condensate tank drain valve simplifies maintenance. The A10051 / ISO 9001 certified manufacturer is “U” stamped and registered with the National Board. The maximum pressure of the air tank is 200 PSI. The tank is made of carbon steel. The size without the skirt is 30″ x 72″. We ranked this product at the top because it features optimal air flow at maximum operating pressure. Air flow is indicated by the unit’s SCFM or standard cubic feet per minute. As airflow goes up, pressure tends to drop. Please take into account the type of tools you will be using with the compressor to determine the correct SCFM and PSI regardless of which compressor you choose. What is the air flow and pressure? How durable is the compressor? How good are the cooling systems? As noted, the volume of air flow and the maximum operating pressure, measured in SCFM, should be taken into account. You need to consider the type of tools you will be using with the compressor to determine the correct SCFM and PSI. Motor power is usually expressed in horsepower (HP). We don’t recommend going anywhere below 10 HP because these compressors are bound to have large tanks. Plus, 10 HP produces greater pressure as well as greater compression. Determine the air flow and pressure before considering the power. You need a robust, sturdy compressor because these large products are quite expensive for the most part. Cast iron compressors won’t rust easily. They are heavy duty and can usually tolerate the worst. Oil is important in the operation of any compressor as it serves to remove heat generated by the compression process. It also provides a seal in many designs. Oil lubricates the crank and wrist-pin bearings and the sidewalls of the cylinder in the case of piston compressors. Rings on the piston provide sealing of the compression chamber and control the passage of oil into it, as with piston engines. Rotary-screw compressors inject oil into the compressor body to both remove some of the heat of the compression process and seal the two non-contacting rotors. Rotary-vane compressors rely on oil to seal the minute space between the housing bore and the vane tips. Scroll compressors are known as oil-less because they do not normally use oil but, of course, their capacities are somewhat limited. Centrifugal compressors are in a different league than their positive-displacement brethren and do not introduce any oil into the compression stream. 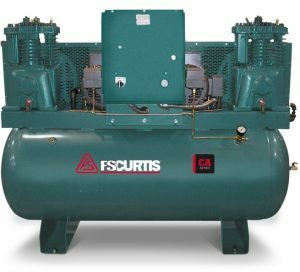 Makers rely on several approaches to create oil-free compressors. Piston-compressor makers can employ one-piece piston-crank assemblies that ride the crankshaft on eccentric bearings. This design does away with a wrist-pin bearing on the piston. Piston-compressor manufacturers also use certain self-lubricating materials for the sealing rings and cylinder liners. There are compromises to make whatever you choose. Some of the disadvantages of oil-less compressors are increased wear, more frequent maintenance, heat-management issues, and reduced capacity. An oil-based compressor is a good idea if it is acceptable to filter out oil or simply live with it. Large compressors can heat up very easily because they often face heavy loads. This is why you should always check how efficient a cooling system is. Most compressors are equipped with aluminum heads or fans for better heat dissipation. You don’t want to be stuck with daily maintenance of such a complicated and huge machine. It’s a good idea to look for compressors that do not require much maintenance or are easy to maintain, as the rotating screw compressors. There are quiet air compressors out there that can give you the maximum performance you need to get any work done, whether at your worksite, the office, or at home—all without the noise. The quietest and most affordable models are those by Dewalt and California Air Tools. These are at least 50% quieter than the rest. They also have great reviews from real-life users and product reviewers online. The low prices are another incentive to purchase. Manufacturers have decided to move the market towards quieter air compressors. A compressor doesn’t have to be loud to be good. Eaton Compressor & Fabrication Inc.
Apart from them, do consider the manufacturers of the other products we’ve reviewed here. Some great 120-gallon compressors ship from China, for example. The 100-gallon air compressor is not very common in the U.S Market. Most manufactures discontinued the manufacturing of the 100-gallon air compressor for lack of demand. 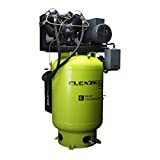 The 100 gallons is falling between the very popular 80-gallon air compressor, which is used mostly by DIY and small business owners. The air compressor manufactures realized that most light users will most likely be using an 80-gallon air compressor or the 120 gallons (second best among light industrial users). On the other hand, the big industrial applications will require the 200-gallon air compressor. Either Way, the 100-gallon air compressor does not have a large market share. Therefore, it was discontinued by most. In our quest, we managed to find only compressors that are shipped directly from China. We don’t recommend users order those because parts and technical support might be very limited. We strongly suggest choosing a 120-gallon option. Hande is a reputable factory supplier that has been in business for over a decade. They have a superb technical team to adjust the design for customers. They specialize in producing air tanks from 5L to 120L. They make steel air tanks and aluminum air tanks for the brake system of trucks, trailers, and buses. The company can supply air tanks with an adjustable design to adapt to customers’ requirements and specific environments. Inside and outside powder coating, salt spray test up to 500 hours. Weight lighter and longer product life. Passed the safety certification in Europe, with CE certificate. All air tanks pass strict testing before being sold to customers. The standard volume and working pressure of the Muye is 4.0-1.3. It can supply 2600 units a day. Produced in a licensed Chinese factor, this is a great quality air compressor tank with a volume of 100 gallons. The tank is for air compressor pistons. Air receiver tanks are designed to provide a supply buffer to meet short-term demand spikes that can exceed the compressor capacity. They can also dampen reciprocating compressor pulsations, make the compressed air system easier to control and separate out particles and liquids. In some cases, installing a larger air receiver tank to meet occasional peak demands can make it possible to use a smaller compressor. Contribute to reducing energy costs by minimizing electric demand charges associated with excessive starting of the compressor motor. It is good for motor lifespan increasing. Muye has been producing and shipping air receiver tanks worldwide since 1996. The systems are compliant with ASME/PED/ISO/SGS/TUV. They have a strong R&D team with powerful technical support. All raw materials and spare parts pass rigorous testing. Service is friendly and helpful post-sale. Most designs are stocked for immediate shipment. Each tank is checked by X-Ray before painted. The authorized manufacturer of Atlas Copco, Ingersoll Rand,Sullair in China. 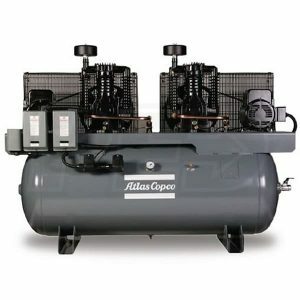 This article offers reviews of the best 100, 120, and 200 gallon compressors and a basic understanding of compressor varieties, power options, selection considerations, applications, and industrial uses. Thank you for reading!